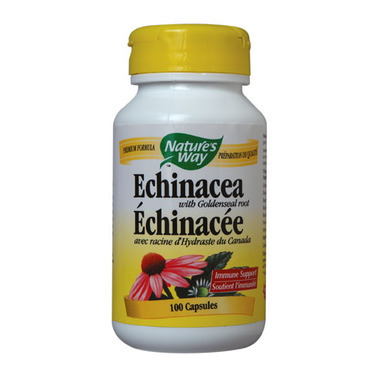 Nature's Way Echinacea & Goldenseal formula is a synergistic formula which supports a healthy immune system. The herbs in this formula have been certified Organic by Quality Assurance International. Directions: Adults take 3 capsules 4 times daily with water at mealtimes. Take at first sign of infection. Warning: Consult a health care practitioner if symptoms persist or worsen, if you are taking immunosuppressants, if you have a progressive systemic disease such as tuberculosis, leukosis, collagenosis or multiple sclerosis, if you have diabetes, or if you are breastfeeding. Consult a health care practitioner prior to use if you have a kidney disorder or if you have blood pressure problems. Consumption of Goldenseal with alcohol, other medications and/or natural health products with sedative properties is not recommended. Contra-Indications: Do not use if you are allergic to plants of the Asteraceae / Compositae / Daisy family or if you have acute stomach irritation, inflammation, and stomach or duodenal ulcers. Do not use if you are pregnant. Known Adverse Reactions: Hypersensitivity (e.g. allergy) has been known to occur; in which case, discontinue use. Some people may experience headaches.